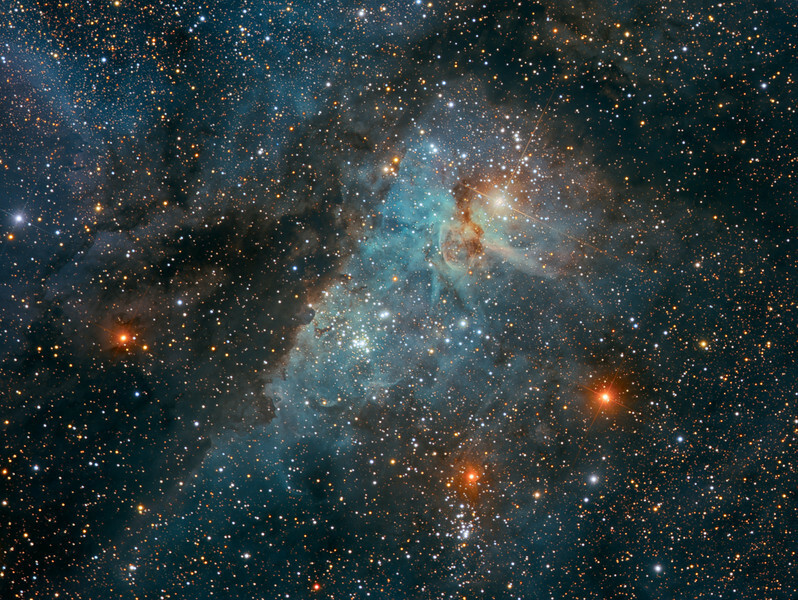 This image shows the Great Nebula in Carina (NGC 3372) in infrared light. This majestic nebula is one of the largest nebulae in the sky and lies about 7,500 light years distant in the Southern constellation of Carina, The Keel. Several star clusters containing some of the brightest and most massive stars known are found here, including the extremely luminous hypergiant star Eta Carinae - one of the prime candidates for the next supernova explosion in our galaxy. Traditional images of the Carina Nebula taken in visible light primarily display the striking magenta colour from glowing Hydrogen gas, as well as large dark obscuring clouds of dust. But infrared light penetrates these clouds better and allows for a deep peek into the heart of the nebula, revealing complex details and thousands of young stars that are otherwise completely invisible. These stars shine primarily in the infrared and appear as golden red in this image. Only a minority of these are even visible in traditional images. The infrared region seems largely unexplored by amateur astronomers. But using a filter that only allows infrared light (>700nm) to pass through allows for obtaining an image of these hidden features. Effectively the band observed is 700-1100nm since the sillicon CCD chip is not responsive to wavelengths longer than that, and this band is called NIR (Near Infrared). One issue arising from this technique is that the NIR band does not have a colour as such, since it lies outside the visible light spectrum. So in this image I have substituted the R channel with NIR which nicely brings out the contrast between the nebula itself and all the young obscured stars that shine primarily in infrared. I used a NIR filter together with G and B filters to create this colour composite. The resulting images were assigned to the different channels as NIR->Luminance, NIR->Red, G->Green and B->Blue.